Our skin provides protection against ultraviolet (UV) radiation, toxins and germs, while retaining moisture to prevent dehydration. Oxidative stress occurs from all metabolic processes, including exercise, and also from exposure to the vast array of environmental toxins and pollutants. While the body naturally has a number of mechanisms that neutralize free radicals, the body’s repair processes slow down and become less effective over time, unable to continuously ward off environmental insults. By completely renewing itself about every 28 days, damaged cells and accumulated waste are sloughed off and replaced with fresh cells. Unfortunately, the regeneration of new skin slows down dramatically with age, and toxins build up. Decreased blood flow to the skin further accelerates the aging by delivering less nutrients and oxygen to keep the skin healthy. Since the skin is the largest organ of the body, we know that anything that improves overall health will also improve the health and appearance of the skin. While topical skincare nourishes the skin from the outside in, it is equally important to nourish the skin from the inside out through good nutrition and supplementation that will support the natural restorative metabolic processes. A healthy, varied and colorful whole-food diet is optimal, but there are additional benefits from skin-specific supplements. Not all supplements are created equal, and regulations regarding the quality and consistency of supplements are poor. Companies can make claims without any scientific proof, so it is imperative to do your research. Let’s discuss some reputable supplements with science behind them that can help you reach your beauty goals. 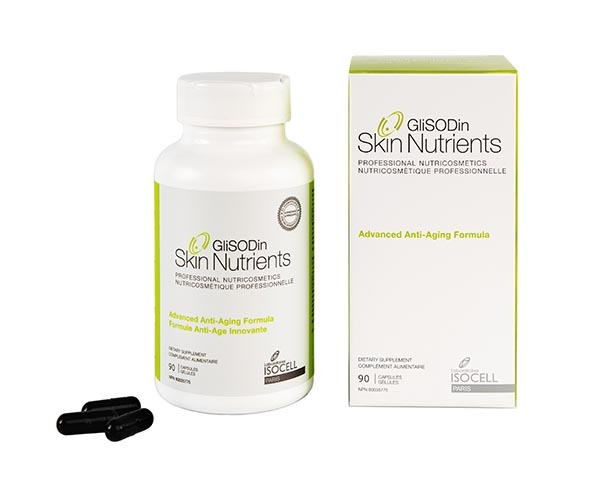 GliSODin Skin Advanced Anti-Aging/Dermal Formula – provides a concentrated formula of essential nutrients to strengthen and protect the skin from within by boosting the body’s ability to combat oxidative stress. 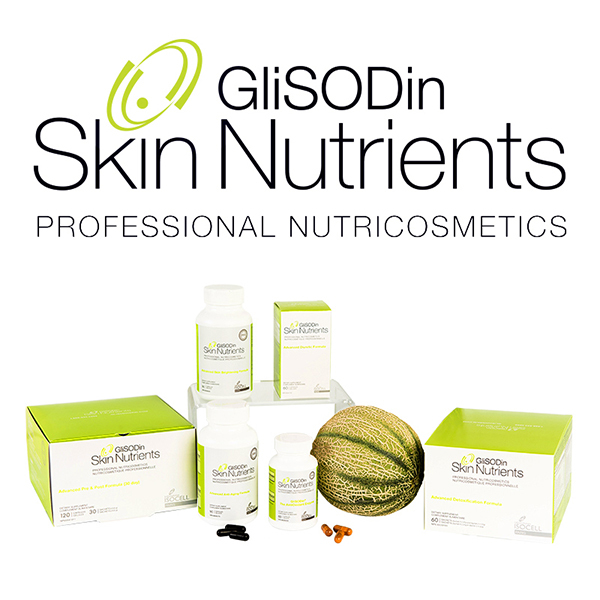 Featured ingredients include GliSODin, a highly bioavailable superoxide dismutase (SOD) extracted from French melon, krill oil to nourish the skin with healthy fats, hyaluronic acid to boost skin hydration and fortify the deeper dermis, and cocoa to enhance blood flow and nutrient absorption. After three months of consistent use, a study noted a 42 percent reduction in fine lines and wrinkles, a 53 percent reduction in sun damage, 100 percent improvement in skin hydration, and an 88 percent improvement in skin elasticity. Dosing: 3 pills, once daily. 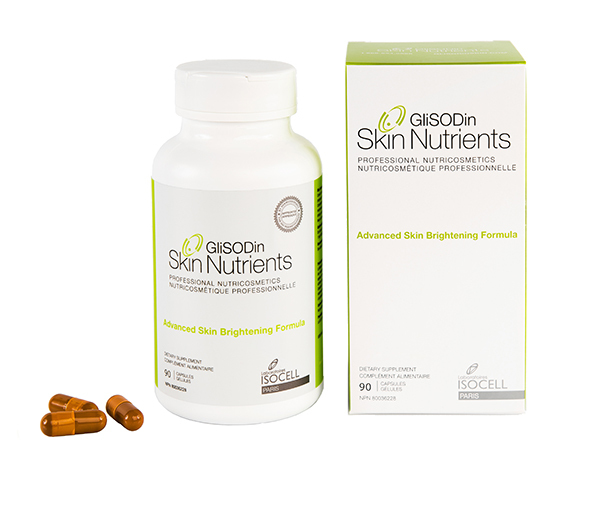 GiSODin Skin Advanced Skin Brightening Formula – helps maintain an even skin tone by reducing oxidative stress while also regulating oil production to help minimize blemishes. Featured ingredients include GliSODin, a highly bioavailable superoxide dismutase (SOD) for antioxidant protection, acerola, lemon balm and hesperidin to reduce abnormal pigment formation, lycopene to protect against UV radiation-induced damage, and borage seed oil to hydrate and soothe inflamed skin. After three months, daily use may improve fine lines, reduce redness, reduce pigmentation, and balance oil for an overall clearer and firmer complexion. Dosing: 3 pills, once daily. Vitamedica’s Anti-aging Formula – contains a highly absorbent combination of multivitamin, mineral, flaxseed oil (omega-3 fatty acids) and a proprietary blend of phytonutrients. Phytonutrients are derived from a variety of different plants and naturally protect plants from UV radiation and pathogens. When consumed, they provide anti-inflammatory and antioxidant properties. This high-quality formula is a nice supplement to cover gaps in the diet. Dosing: One morning and one evening packet that each contains 3 capsules. Vitamedica’s Healthy Skin Formula – formulated with nutrients that promote skin health, balance oil production, and reduce inflammation. The key ingredients include zinc to reduce inflammation and regulate oil production, vitamin A to reduce clogged pores, MSM which acts as a natural antimicrobial, and selenium and bromelain, which reduce inflammation. The formula also includes a proprietary blend of detoxifying herbs to help support a clear complexion. Dosing: 2 capsules daily. The Vitamedica Clear Skin Formula contains the same formulation as the Healthy Skin Formula with an additional softgel capsule of hyaluronic acid. The hyaluronic acid is hydrating and especially beneficial for dry, sensitive or aging skin. Dosing: 3 capsules daily. Lumity – consists of two daily a.m. and p.m. packs: the mocha-colored morning packet contains a mix of vitamins A, B, E and C, selenium, flaxseed oil, and the Lumity VITA complex (acetyl-L-carnitine, L-cysteine, coenzyme Q10, and turmeric root extract), and the white evening packet contains flaxseed oil and the Lumity RENEW complex with their mix of potent amino acids. Lumity purports to be the only supplement on the market to address all nine causes of aging. The ingredients in the a.m. packets are specifically formulated to increase energy, boost collagen and elastin formation, clear out toxins, and repair oxidative damage to protect your DNA for maximum functional efficiency The ingredients in the evening packets claim to stimulate the release of growth hormone to improve sleep and rejuvenate the body. After 12 weeks of use in 50 women ages 35-65, 84 percent noted improved energy and better sleep, 76 noted noted an improvement in skin hydration, and 92 percent noted a significant improvement in the condition of nails, hair and skin. Dosing: One morning and one evening packet that each contains 3 softgels. Heliocare – contains a powerful extract of Polypodium leucotomos fern, which is found in Central and South America. Numerous scientific studies have been performed with this supplement showing improvement in many sun-sensitive conditions. Fernblock PLE Technology containing a powerful antioxidant formula with Polypodium leucotomos extract helps your skin protect itself from UV radiation and maintain a youthful appearance. Dosing: 1 capsule in the morning. It can be taken every two to three hours if exposed to UV radiation during the day, but it cumulatively works by taking daily, not intermittently. 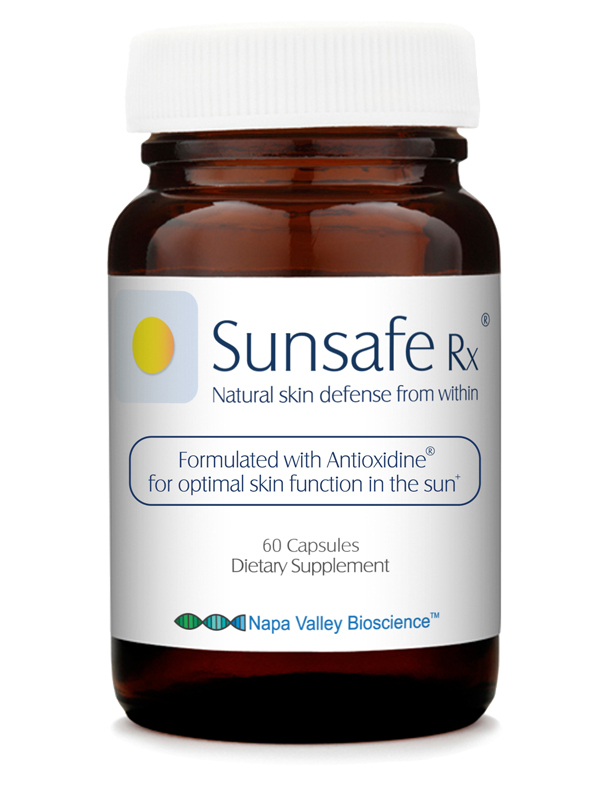 Sunsafe Rx – contains Polypodium leucotomas in a proprietary “Antioxidine” complex combined with other antioxidants, including lutein, zeaxanthin, green tea extract, omega-3 fatty acids and grape seed extract, in addition to other basic vitamins. The specific antioxidants help to protect agains UV-induced sun damage, prevent skin aging and support the overall health of your skin and eyes. Dosing: 1 capsule in the morning. A consistent theme in “nutraceuticals” and “nutracosmetics” includes healthy fats, anti-inflammatory and antioxidant ingredients. Antioxidants restore balance to the body and inhibit cell damage due to oxidative stress. Omega-3 fatty acids reduce inflammation and restore a healthy hydrated balance to the skin. Whichever supplement you choose, give it a minimum of three months to work. As with any supplement, the more deficient your body is, the more dramatic of a response you will see. Maintaining health is an equally important goal. Everyone needs to determine their goals, and if your goal is to be healthy and have radiant skin, it is vital to redirect your energy toward meaningful behavior that will help you achieve these goals. Eighty percent of results are about behavior, not knowledge, so choose to do a few things every day to strive toward your goals. Eat less junk, choose vibrantly colored real foods, avoid smoking, drink less alcohol and soda, and start a skin care routine and supplement today. Since the skin functions less effectively over time, early support is necessary. Making new habits through good choices determines your future, and this power lies within yourself.